Less a record than a highly calculated means to a bigger end, Lights Out is an attenuated statement of purpose to further develop the Michaelson brand. Beginning with her 2010 single "Parachute", Ingrid Michaelson began the transformation from singer/songwriter to pop chanteuse. Over the course of her carefully choreographed career, Michaelson went from MySpace discovery to ukulele-wielding kewpie doll and piano balladeer. With every step, Michaelson's commercial appeal has benefited from lucrative placements ranging from an Old Navy ad ("The Way I Am") to TV soundtracks (Grey's Anatomy, Parenthood, Ugly Betty) and a cross-promotion with retailer Anthropologie for the release of her 2012 album, Human Again. An independent artist in the sense that she remains unsigned, Michaelson continues to front her own career, releasing music on her own label under the guidance of the management team who discovered her in 2006. 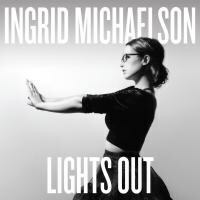 Her fifth studio album, Lights Out, finds Michaelson looking to increase her market position with minimal risk. In a marked departure for the solo artist, Michaelson worked with a team of ten different songsmiths including Nashville's Trent Dabbs and Barry Dean, singer-songwriter Katie Herzig, and writer/producer Busbee (Pink, Katy Perry, Lady Antebellum) to craft the album's 14 songs. Listing six producers and as many duets, the inclusive creative process was a necessary one to help Michaelson "get the darkness out and help turn it into light" after medical issues sidelined her writing in 2013. Preceding the release of Lights Out, the infectious single "Girls Chase Boys", co-written with Dabbs and Dean, was released in February. Citing the song as a "bridge" by which to respect "what people want, but showing them what I can do", the single was packaged with a purloined video send up of Robert Palmer's "Simply Irresistible" by way of Shania Twain's 1999 gender-reversing "Man! I Feel Like a Woman! ", to generate buzz and monitor online impressions for the marketing campaign. The focus of Lights Out is similar pop radio fare, from the synth-laden "Time Machine" and clapping "Warpath" to the affirmations of "One Night Town", a duet with Mat Kearney that's ready-made for Nashville (or Nashville) crossover success. The strength of Lights Out remains the artist's own material. It cannot be denied Michaelson is deftly capable of crafting and delivering a pop song, no matter how transparent the lyrics. Cooing opener "Home" hints at the darkness Michaelson hoped to expel. No matter how cloying, "Wonderful Unknown" deserves to soundtrack tender, televised moments while the quasi-religious atmospherics of "Handsome Hands" highlights Michaelson's dynamic vocal range. Sadly, in the bloated context of Lights Out, these quieter moments are obscured by the pop veneer and multiple voices elbowing for attention. To deny Michaelson's talent would be to discount her success. Totaling sales of more than one million albums and five million singles from her first four albums, Lights Out will undoubtedly add to her tally of digital downloads and YouTube views. Less a record than a highly calculated means to a bigger end, Lights Out is an attenuated statement of purpose to further develop the Michaelson brand. From a critical standpoint, Lights Out is long on songs and contributing credits but falls short of measurable artistic growth; from a commercial standpoint, the success of Lights Out will be determined not only by units sold but by how well it converts partitioned ones and zeroes into dollar signs by saturating any and all possible media outlets. License, rinse, repeat.